Are you letting work-related stress get the best of you? If so, you might want to consider engaging in the hottest new trend that is hitting the workplace: mindfulness. According to a recent study published in the Centers for Disease Control and Prevention (CDC) journal Preventing Chronic Disease, 1 in 7 American workers say they practice mindfulness-based activities. The study surveyed over 85,000 adults and found that meditation rates among U.S. workers increased from 8% to almost 10% from 2002 to 2012. While this may not seem like a huge shift, this is great news for American workers. Work-related stress is common and it is associated with many physical and mental health problems. These problems include high stress levels, mood swings, decreased productivity, and higher risk of chronic diseases . 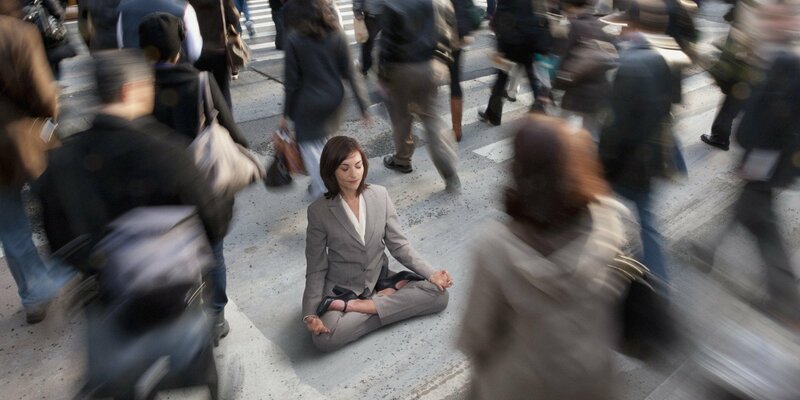 Meditation and mindfulness practices, however, have been scientifically proven to boost employee well-being. Researchers note that incorporating mindfulness practices into the workplace experience will encourage employees to include mindfulness into their daily routine. These practices can be employee wellness and stress-reduction programs, meditation classes or web-based offerings. Mindfulness, or “the intentional and nonjudgmental conscious awareness of the present moment,” is the primary element of these programs. It is a therapeutic practice that provides mental and emotional health benefits for workers. The study claims that mindfulness practices can increase “workers’ resilience, thereby enabling them to better deal with stress, while preventing burnout.” Additionally, workers who engage in mindfulness-based activities on a daily basis experience an increase in productivity, memory, creativity, focus, impulse control and emotional intelligence. This is why a focus on exercising the mental health of employees will create a more productive workforce for any company. While some companies may stress the financial aspect of incorporating mindfulness-based practices into the workplace, the practices can be quite simple. For example, practicing a controlled breathing exercise in a conference room for 10 minutes a day can provide immediate benefits such as controlled blood pressure and improved heart rate. Bringing in a local guide or mindfulness coach to facilitate live weekly mindful sessions is a great start on the path to a more mindful workforce and robust bottom line. Originally published at www.recharj.com on January 18, 2017.